The words people write are very much like the clothes they wear. You could say that the major role of clothes is to protect us from the elements. However, if we pause to think of the role they play, we will see that keeping us warm (or cool) is only one facet. Just as it is important to put a period at the end of each sentence, it is also important to wear a tie to a formal event or a dark suit to a funeral. Likewise, if you are going to go swimming you would most likely wear a bathing suit. In many cases, the kind of clothes that we wear and how we wear them, according to the occasion, can make all the difference. Like it or not, people judge other people based on appearances. A natty suit at a job interview may not get you the job in and of itself, but it is likely to help rather than hinder you. If you button the top button of your shirt (at least in my country when I was growing up) you were considered to be a nerd. So this might not help a young man on a date, even though the shirt and the young man are nice. Language works very much the same as clothes. There are usually many ways and many words to express your ideas. You may be understood if you use any of the options available to you. However, according to how you phrase your thoughts, and your intended audience, the impression you make may vary greatly. I clearly remember a sign on a coffee table at an employee lounge in an office where I once worked. It said “Kindly remove your clutter”. Though I never left any “clutter” behind, I always disliked the use of that word. To me, it meant that staff were guilty of leaving things piled all over the table and not picking up after themselves. I would have preferred to have seen something like: “Please keep this table clear”, or even “Please help us keep this table clean.” The message of all three signs is more or less the same, and perfectlycomprehensible, but they are “dressed” differently and therefore received differently. We as translators are also writers, and as writers we are entitled to our own style. Open any book and read any paragraph. You will immediately recognize that the author has his or her own way of writing. We can write longish sentences broken up with semicolons and connecting words like therefore, although, and however; or we can chop them up into smaller units that end with a period. We can choose whether we want to use words that are cognates of the source language such as marvelous for maravilloso, or we can decide to use a word such as wonderful instead. Sometimes we have choices and other times we are constrained. Let us look at some different situations and how they may be handled. How then do we arrive at our own personal writing style when translating? I see three major elements that come into play: The original style, the circumstantial style, and your own personal style as the translator. There must be a happy equilibrium between the three for there to be a clear, concise and cohesive text. There is no point in translating a text if the target audience is unable to understand what you have translated. You are therefore limited by what your target language is capable of expressing and what your target readers are capable of understanding. This is what I call the circumstantial style. Your personal style is the icing on the cake. It can either make or break a translation. No matter how many dictionaries and software programs you use to do your translation, you are the ultimate creator of the target text. Just as everyone has his or her own way of speaking and writing, each translator has his or her own way of sorting out the source text and giving life to his or her translation. Why should you choose your own style? You as a translator are one of a kind. You need to use your originality to your advantage and show the world how well you can write and, more importantly, how well you can convey the author’s ideas. For the sake of consistency, it is important to always, or almost always, translate a term or phrase the same way according to context, of course. This is especially true if we are talking about the same document, as a sudden shift of gears would be disconcerting to the reader. Perhaps you are a busy translator like me and do not have much time for jotting down strategies. However, whenever you do have a free moment, write down some examples of your style. What words and phrases are you going to use and what words and phrases do you absolutely not want to write? I like verbs that are packed with meaning, and I like adjectives that are crisp and concise. I don’t like the word collaborate or any of its various forms. I am not saying that it is not a valid word, but I did not hear it much when I was growing up, and I find it is used too often in Spanish. I would advocate the use of cooperate, work with, work together with instead. A phrase that I would never use is: That said, or Having said that. There is nothing wrong with writing these, I suppose, but I have always thought that it is understood that the writer had already said or written something. I don’t see a need to emphasize it that way. Why do you speak and write the way you do? The answer to this question is key to defining your style. For speakers, I turn to my favorite high school teachers and university professors as well as famous people who are featured in the media. For writers, I turn to great works of fiction, newspapers and magazines (and more recently web pages and blogs). I am also a big sign reader. I feel that if a message is posted on a sign, i.e., telling people either to do or not to do something, it is most likely representative of what a translator should write in his or her translations. As I said above, it is important to translate terms the same way throughout a document. More subtly, it is also important to keep the same style. You don’t want to mix formal terms such as a great deal with other more informal ones such as a lot. This would be like wearing a suit and tie to the office in the morning and coming back after your lunch hour in a T-shirt! Even within the same register, you have to decide whether to use will or shall. As I was told long ago, and rightly so at one of my 9 to 5 jobs, “La memoria es frágil” (The memory is fragile). Time permitting, you need to jot down why you used a certain term, style or register for future reference. Microsoft Word has the comments feature, which is perfect for this. These days, most CAT tools have a note feature that does not interfere with the target text itself. Then, when you go over past translations, you can use these notes as a reference. As a 21st century translator, you are probably already aware of how fast terminology changes. Do you have a shelf of paper dictionaries that you don’t use because they aren’t up to date and don’t include terms that the people of today use on a daily basis? Consider these words: blog, Internet, World Wide Web, VoIP, and e-mail. How long have they been readily used by the public? 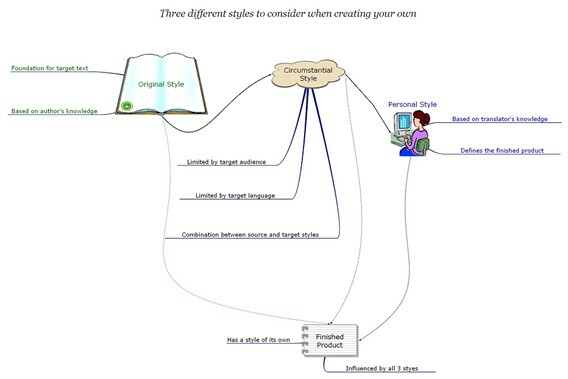 As you read and translate more, your style will also be modified, either consciously or unconsciously. It is important to pair this natural growth with questions, questions and more questions. Be sure to answer all questions and concerns you have on grammar, meaning, and register: in other words all the elements of style you will need. Make lists, contact experts via e-mail and telephone. Go over old translations and see how you could improve or streamline your style. Read style guides in both your source and target languages. Take a second look at your wardrobe of translations. Does everything match? Are there things you had better eliminate?Is there something you should add? You as the wearer have the ultimate choice. Reed D. James is a Spanish-English freelance translator specializing in legal and marketing texts. He lives in Santiago, Chile with his wife and two children. When he is not busy translating, he enjoys familiy outings, playing the piano and physical fitness.